The LifeProof iPhone 4 case is the thinnest proof-everything case you can get right now. Like Griffin's Survivor case, the LifeProof case meets military standards and protects your iPhone 4 against water, dirt, snow and shock. Unlike Griffin's Survivor case, the LifeProof case is actually water-proof and not just water-resistant. This means that with the LifeProof case you can take a shower with your iPhone 4 and even dive underwater up to a depth of 6.6ft (2 meters). This case is very impressive especially because of how thin it is, only adding 1.5mm of "bulk" to your iPhone 4. All of these specs sound really good making the LifeProof case the ultimate iPhone 4 case, at least until we can get our hands on one to review and test out. 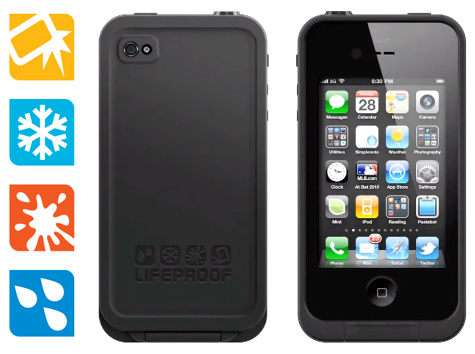 The LifeProof iPhone 4 case is now avilable to pre-order for $69.95, most likely in black only. Hit the source link for more.